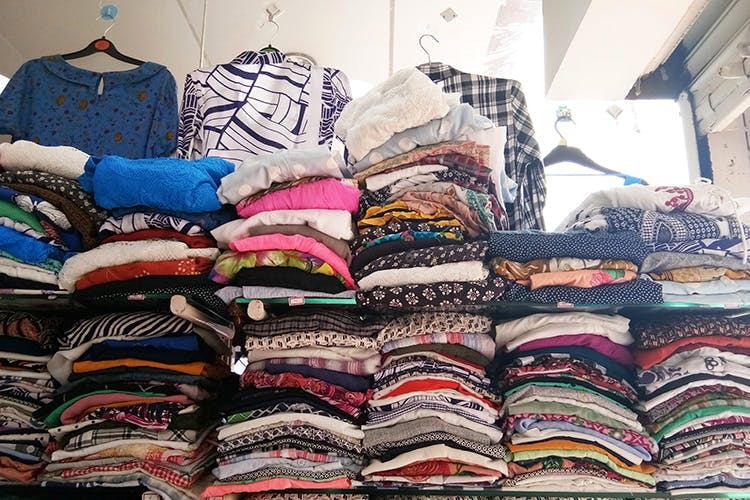 A tiny shop by the wayside on the Kammanahalli Main Road, Angrez Fashion stocks export surplus tops, tunics, and dresses from top brands at throwaway prices. Ladies! If you are looking for branded clothes at jaw-dropping prices, then we recommend a trip to Angrez Fashion in Kammanahalli. Located near KFC (they have two outlets at a short distance from each other), this fashion store is a neighbourhood favourite especially if you are looking for casual wear that doesn’t cost the earth.They mostly cater to women and you can pick up tops (INR 350), tunics (INR 450), and dresses (INR 650). Since this is an export surplus shop, many of the items here don’t sport a label but we did spot the likes of Allen Solly, Vero Moda, Stella McCartney, ONLY, and Tommy Hilfiger. What we love about this shop is that they have a variety in prints and styles. They stock sizes from S to XL and you have a quite a few options to choose from. On our trip, we found breezy cotton tops with vibrant paisley prints, smart crop tops, and plain tunics with elegant cuts. While they have plenty on offer, Angrez does not showcase a curated collection. You’ll have to spend at least 20 minutes to go through the racks and find something that will suit your style. While some items look fairly dated (in terms of trend), others immediately catch your eye. But sometimes you'll have to just walk out empty-handed depending on the stock.